Feeding time for the Christmas bunnies. Spreading the news about the Christmas bunnies. If you’ve done your homework and determined that you and your family are ready to welcome a rabbit into your home, then consider adoption! 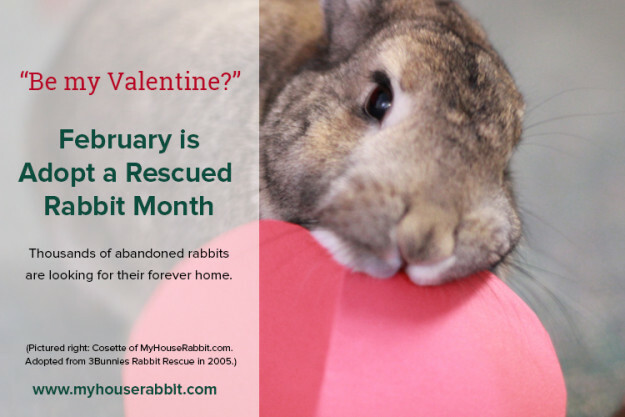 Rabbit rescues and animal shelters are continually overrun with homeless rabbits. There are bunnies of all ages, shapes, and sizes just waiting for their forever homes. A shelter volunteer can help match you up with just the right bunny (or pair of bonded bunnies). Plus, adopting a rabbit from a rescue or shelter doesn’t just benefit the bunny. 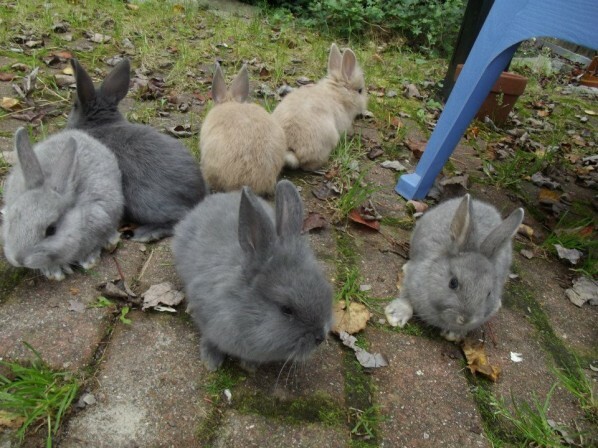 Many rescues litter train the rabbits in their care and acclimate them (if needed) to living inside the home. Further, if the rabbits are mature enough, most rescues will have the rabbits neutered/spayed. This will save you money on vet bills for the procedure. If you’re ready to find a bunny in your area, you can start with PetFinder or you can check out the House Rabbit Society website for links to all of their regional chapters. T.H.E. Rabbit Resource, the New York State Chapter of the House Rabbit Society, is in dire need of your support. They recently took in a significant number of pregnant strays and rescues, and now, as you’d expect, they have a baby bunny bounty on their hands. Some of the babies have major health issues, such as one little guy known as Renny Hillbilly James. 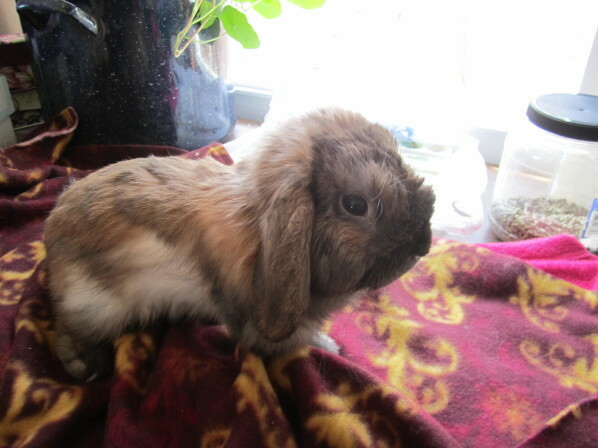 This bunny is severely underweight and is also in need of a couple surgeries. If you would like to help, visit T.H.E. Rabbit Resource’s donation page. Watch the beautiful story of Heather and Lillian who are currently living at the HRS Rabbit Center after starting their lives as lab rabbits. These two experienced many firsts at the rescue – first loving touch, first hay, first lettuce, first flop. They are waiting to be adopted into their first (and forever) loving home. Marcy Schaaf is the woman behind the California rabbit rescue, SaveABunny. Fifteen years ago, burnt out from working as a high-level advertising and marketing executive, Schaaf decided to step out of the rat race. She used this new found free time to foster bunnies, and quickly fell in love with the species. 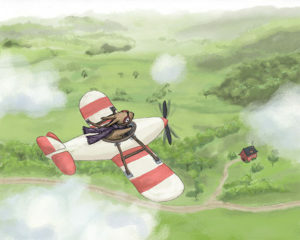 Since then, she’s put her work ethic and business skills to work running SaveABunny. The all-volunteer organization has saved over 5,000 rabbits from being euthanized. Recently, the group was awarded a $25,000 grant from the ASPCA to expand their operation. To learn more, visit the SaveABunny website. One of the adorable cards available from the RSPCA. 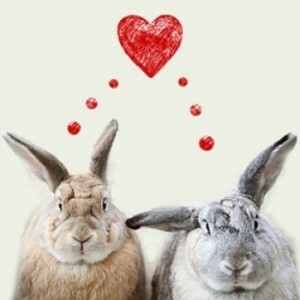 Spread some love this Valentine’s Day with a Rally Round a Rabbit Charity Gift. You can send a sweet card to your special someone and support a rabbit cared for by the RSPCA at the same time! Another idea is to make a donation on someone’s behalf to a local rabbit rescue. Rabbit rescues will certainly appreciate the support. Don’t forget- February is Adopt a Rescued Rabbit month! Jenny Nichols has started a rabbit rescue at her Lamoine, Maine home. She takes in unwanted and neglected rabbits from the area, working with the local SPCA. She cares for the rabbits until they are adopted into their new forever homes. A few years ago, Nichols wouldn’t have imagined she’d be running a rabbit rescue. She never identified as being an “animal person” and wasn’t particularly drawn to rabbits. But when her daughter begged her for a pet rabbit, she conceded… only to realize that once the excitement wore off, the rabbit was now her pet. She researched how to properly care for rabbits, and over the years, developed a deep respect and love for them. She wanted to do something to help abused and abandoned rabbits, and so Cottontail Cottage Rabbit Rescue began. Rabbits come to her for a few different reasons, including impulse-buy Easter gifts for children that are no longer new and exciting a month later or from breeders who’d like to cull them for physical deformities. 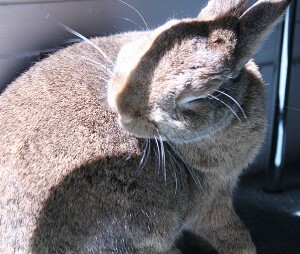 Now with over 30 rabbits in her care, Nichols is appealing to the public for donations. For more information visit the Cottontail Cottage Rabbit Rescue website or their Facebook page. See also the Bangor Daily News. To promote rabbit care and adoption, AfFURmation and Bunny’s Blog are co-hosting a Rabbit Adoptathon Hop starting Sunday, May 13th at 6pm ET and ending at 6pm ET on Saturday May 19th. If you have a blog, create a post anytime during this week about rabbit care or share information about adoptable bunnies. Add in the Rabbit Adoptathon badge (code below) so others can do the same on their blogs. If you’re on Facebook, you can share an adoptable bunny’s information by using the Facebook Share button located on each animal’s profile page on Petfinder.com. 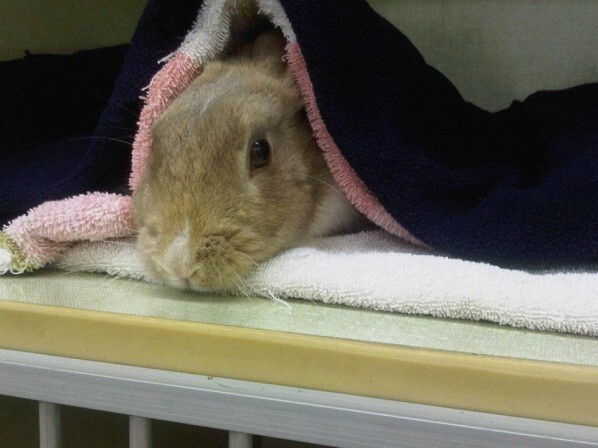 One former Canmore bunny recovers from spay/neuter surgery at Edmonton’s Southside Animal Hospital. Last year, the Canadian town of Canmore, located about 60 miles west of Calgary, had a big problem. Abandoned pet rabbits had bred with each other and caused a feral rabbit explosion. Town officials initially planned to cull the rabbits, but a public campaign and the Earth Animal Rescue Society (EARS) made it possible to sterilize them and relocate them to sanctuaries. From January until April, the town of Canmore trapped and sterilized hundreds of feral rabbits. 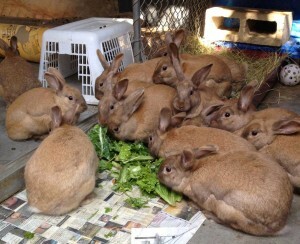 These rabbits are now happily living in local sanctuaries. EARS plans to break from the trapping for the summer and resume in October to catch the remaining rabbits.